What if you got knocked to the ground during a confrontation? Breath control will help you shoot straight and stay alert to other elements of the environment. Photo by N. Anderson. Stance. Grip. Sight alignment. Sight picture. Breath. Trigger press. Follow through. These are the seven fundamentals that every competent shooter applies, even if they don’t call them by those labels. There is plenty of information around about developing skills for six of the fundamentals. But where concealed carry is concerned, breath is often ignored. That’s a shame, because mastering breath doesn’t only make you a better shot, it makes you more effective before, during, and after the sort of events that inspired you to carry a firearm in the first place. Since your breath is with you at the range anyway, you might as well use it to your advantage. 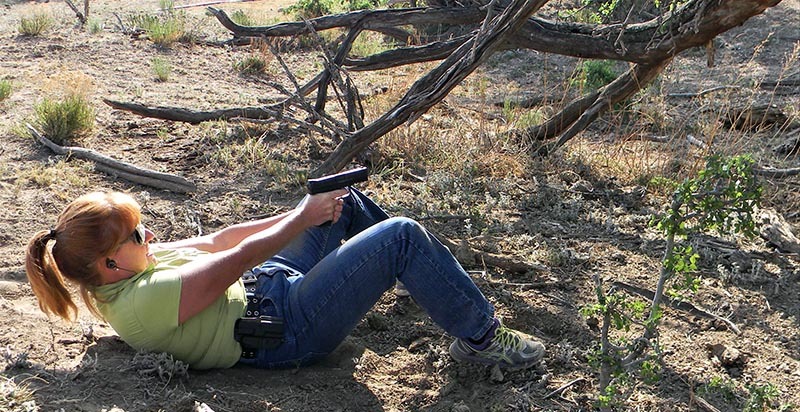 For typical defensive shooting training at distances of about 15 yards or less, just breathe. It seems obvious, yet I see many people tense up and forget to breathe while aiming and firing. Holding the breath, even unintentionally, is detrimental to accuracy. It doesn’t take long before the body “demands” a breath, distracting the shooter from the other fundamentals. When shooting for pinpoint accuracy or over longer distances, it can be beneficial to utilize the respiratory pause in a technique borrowed from rifle marksmanship. Taking the slack out of the trigger during exhalation, so that each shot breaks when the lungs are empty, is a way to insure the body’s slight rise and fall associated with breath doesn’t stand in the way of accuracy. Purposeful exhalations can allow multiple shots to be fired with good accuracy at distance, too. Paying attention to the respiratory pause is particularly useful when firing from a prone position. Maintain peripheral vision, critical for awareness of a dynamic situation. Preserve fine motor skills, helpful for tasks like keying in the combo to a gun safe, defeating holster retention, or putting the safety in the “off” position. Retain your ability to communicate clearly, whether to people in the vicinity or a 911 operator. Keep at your disposal clear thinking and the ability to take in as much information about the immediate environment as possible, while remaining focused on the threat. An elevated heart rate under stress isn’t necessarily a bad thing, so long as it stays beneath the excessive 100 beats per minute. Elite athletes seek to be in “the zone” where perception and decision-making are better than normal, and a slightly elevated heart rate—between 75 and 99 bpm—is part of that state. In an emergency, including one where you may need to save a life using a firearm, breath control is a primary agent of heart rate regulation. There’s no denying that exploiting this shooting fundamental, which is always with you, is beneficial. Here are three approaches to breath control. Practice each and pick the one that suits you best. Deploying the pistol and breath management go together like salt and pepper. (Attire by Propper and Exos Gear. 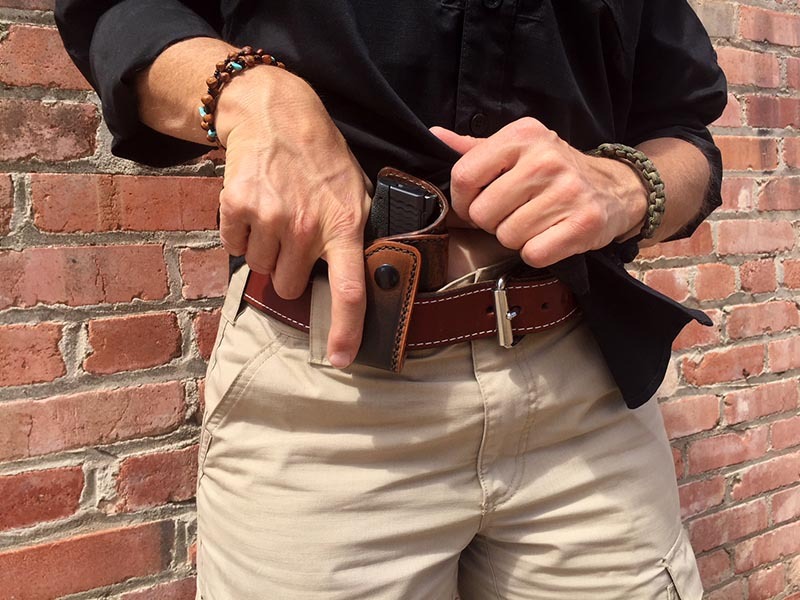 Holster by Blackhawk). Photo by Team HB. Combat breathing is a technique I first learned of at a Lt. Col. David Grossman workshop. This simple but structured method is used by many police and military groups. Inhale to the count of one-two-thee-four. Hold the breath on full lungs for a four-count. Exhale, again to the count of one-two-three-four. Hold the breath on empty lungs for a four-count. Repeat. There’s even a free combat breathing app to talk you through it. Check out Tactical Breather. Put the tip of your tongue just behind your upper front teeth, and inhale. Your breath will naturally be deep and relaxing. This technique works great, unless you’re having to speak at the same time. Simply inhale in a manner that gives the sensation that your belly, not your chest, is expanding. While this technique is the simplest, it also may be the hardest to remember in combat or a potentially combative situation. Deliberate practice of a breathing method in non-stressful times will enhance your performance on the range when the technique is purposely inserted into the application of the other shooting fundamentals. Practice often, and you’ll be able to make better decisions and more accurate shots under the effects of adrenaline or cardiopulmonary exercise, on the range or in the real world. If you haven’t gotten my drift yet, breath management is a great skill for dealing with stress-inducing situations, whether they involve firearms or not. In a moment when the line between life and death seems thin, using breath control is a way to toss yourself a lifeline. Subscribe to our FREE newsletter so you can stay up to date whenever we publish articles like this. I learned a method very similar to the 4-count process you describe, many years ago. The 5-count breath cycle! Very simple, very effective.